The Legend series has gotten better with each book. After reading Legend, I didn’t think Lu could write anything better. Then I read Prodigy and was amazed at how Lu outdid herself, but was sure she couldn’t top it. There was no way. And then there was Champion. Even if she had written a novel that wasn’t as great as the first two, it would still be fantastic. But I loved this book even more than the first two. It’s not a “let’s wrap this up in the perfect bow” book. It’s a “let’s make an impact and give the characters the ending they deserve” book. June is one of three Princeps-Elects. She is getting a firsthand experience in the world of politics. Day has a high-level military position and works to keep the peoples’ faith in the Republic. Despite their high ranks, life isn’t perfect for them. June feels out of place in politics, even though she knows it’s a position of high honor. Day is trying to move beyond the past and make a new life for him and his brother. But there’s a piece missing in their lives they both try to ignore. When they are brought together again because of a growing threat, they have to deal with saving the Republic and saving their relationship. The characters are what make me love this novel. The plot and action are nice, but without the right characters, I probably wouldn’t have loved reading this book so much. June is analytical, but that’s the way she keeps her head when everything is falling apart around her. When she lets her guard down, though, she’s vulnerable and just wants something, someone real to hold on to. Day has a tough exterior, having to fight for everything growing up. But he cares so much for the people he loves that he would do anything to take pain away from them. These two characters alone are what make this novel so amazing, not to mention all the secondary characters. I was on the edge of my seat the entire time. I wasn’t sure how Lu would be able to end things. I had all these ideas and scenarios in my head, but none of them compared to what actually happened. Just when things look like they’re getting better, something pops up and a whole new plan has to be formed. I felt my heart drop at times, only to have it lodged in my throat a few moments later. Champion is the best ending this series could have. It wrapped things up, but left pieces to the imagination of the reader. There’s tragedy and pain, but hope and happiness, too. This is the ending the characters deserved. The entire Legend series is a must read. The Legend series is one that kind of came out of nowhere and hit me in the face. 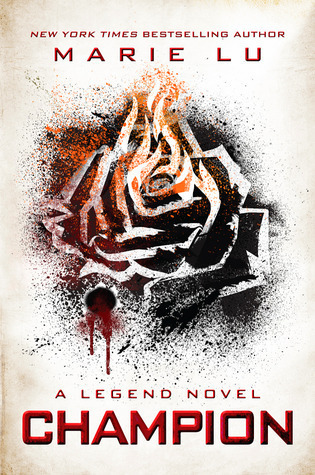 I really hadn’t meant to read Legend, but a friend gave me the book and told me I should read it. I trust her judgment, so I picked the book up and read. Thank god I did. Legend hooked me right away, pulled me into the world of June and Day, and made me care. Then Prodigy came out and I had to have it right away. I needed to see what was going to happen next. And then I finished it and thought I would have to wait a year until getting my hands on the final book. So imagine my surprise and joy when Lu told the world the final chapter in the Legend series would be released in November. I think the smile stayed on my face for a couple days and I had to explain that it was over a book being released earlier than I thought. Only true book lovers understood why that would etch a smile onto my face that wouldn’t leave. Let’s be real, with a description like that, the sooner it can be released, the better. There’s only so much my heart can handle and I am certain Lu is going to push, bend, and break it in all the right ways before hopefully putting it together again. There are so many possibilities within this book that just thinking about what might be coming gets overwhelming. Champion will be published on November 5th, 2013 by Putnam publishers. Let me know if you’ll be joining me as a midnight reader! I’ve been getting lucky lately when it comes to reading the middle book in a series. So far, they’ve been avoiding the sophomore slump and have been as good, if not better, than the first novel. Prodigy definitely doesn’t disappoint. There is no break in the action from Legend. The story starts right away with June and Day trying to find the Patriots. From there, it is non-stop, keep-you-on-the-edge-of-your-seat fantastic. The world Lu has created drew me right in and it felt like I was running right along with them. June and Day’s relationship has moved quickly. They’ve only known each other for about a month when all of this goes on. That doesn’t bother me though. There is something so perfect about how these characters are written, so amazingly human and real, that everything that happens feels perfect. They have those lusty moments teens are supposed to have, they can be over-thinkers, jealousy is there, they say things without thinking…all of that combines to create two wonderful people in the middle of a sweet romance in the middle of a crazy world. The twists and turns this novel takes are out of this world. Just when I’d think I’d have something figured out, Lu would throw a new loop in and pull me completely off course. And the ending. Wow. I had been hearing about the gut-punch that was awaiting me at the end of this book and thought I was ready. I had prepared myself for so many different scenarios that when the end actually came and I turned the last page, I was still reeling. Prodigy is the kind of book that you can’t start and stop. You have to sit down and read it all in one go. It pulls at your heart, hurts you where it counts, and yet you still keep coming back for more. I cannot wait to get my hands on Champion and find out what is in the future for June and Day. I’ve had this sitting in my kindle for a while now and I’m not really sure why I kept passing it over. But a couple days ago, I saw it sitting there and I just went for it. I’m incredibly glad I did. 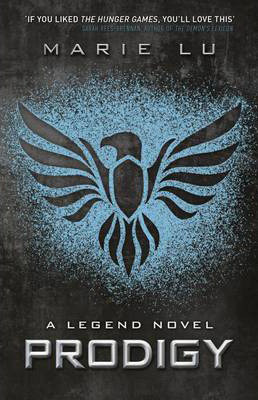 Legend was a fantastic novel that had the right mix of action, romance, and explanation of the dystopian future Lu created. I was so happy to find that both main characters are strong people. They might depend on each other at times, but they can make their own way. They know their strengths and weaknesses and make each situation work as well as it can for them. I loved June. She could have easily come off as a very cocky individual, but she downplayed her talent just enough to make her lovable. And Day could have easily gone down the same overly cocky path as June, but Lu wrote him with just a touch of that arrogance and it made him perfect. He knew he was good, but he didn’t let that take over. He kept himself in check. Even the supporting characters are wonderful. I especially love Tess. She found herself in a bad situation and with a little help from Day, managed to make herself into something more than she ever would have been without him. The love aspect of this story fits amazingly. There’s not too much, but there’s just enough to make you swoon. Any more romance and it wouldn’t have been believable. June and Day don’t have time to fall in love the normal way. They’re under so many pressures and stresses that the way it comes about makes perfect sense. Legend was a fabulous, amazing read and I can’t wait to read the next part of June and Day’s story. Lu definitely has me hooked.